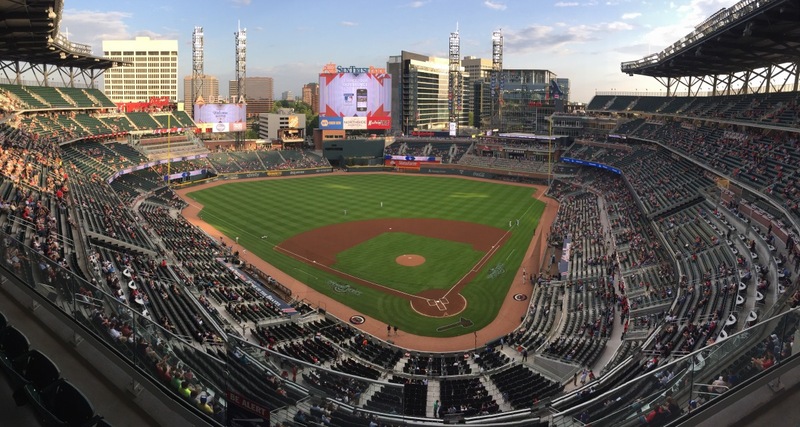 Even though the Braves' second home in Atlanta, Turner Field, was only two decades old, the owners decided to make a deal with Cobb County, and in 2014 announced their plans to relocate. The new ballpark, SunTrust Park, was completed in plenty of time for the 2017 season, but some of the transportation infrastructure remained uncompleted by Opening Day. It is all part of a new high-rise retail/residential high-rise complex, aiming for the best of the urban and suburban lifestyles. The location was chosen based on where the greatest number of Braves fans live, on the north side of Atlanta. At eight miles distant from downtown, it is more remote than any of the contemporary "neoclassical" stadiums, other than Globe Life Park (in Arlington), home of the Rangers. The field dimensions are quite similar to those of predecessor, Turner Field, except that the outfield walls are straight with clear angles, whereas at Turner Field they were mostly one broad curve. There is much less foul territory compared to Turner Field, and the position of the grandstand resembles those of Marlins Park and PNC Park. The playing field is about 25 feet below ground level, like most other newer ballparks. SunTrust Park has four decks extending all the way around between the foul poles, the only other such stadium being Miller Park. One feature that becomes immediately apparent is the huge roof, which covers both upper decks, extending for about 15 feet in back. Apparently, many fans in "Hotlanta" complained about the lack of shade in Turner Field. The portions of the upper deck near the right and left field corners are uncovered, however. The second deck is larger than in most other baseball stadiums, while the lower deck is smaller; both features are characteristic of Yankee Stadium II. There are large table-seating areas in both left field and right field, where the new "Chop House" is located. The Braves struggled for much of the year in their new home, but showed improvement toward the end, finishing in third place in the NL East Division. To the surprise of many people, they were in first place for almost the entire first half of the 2018 season. With a team full of eager young stars, the new home of the Braves can expect to host ball games in October for years to come. In December 2015 it was announced that after the Braves left, Turner Field would be converted into a football stadium, to be the new home of Georgia State University. The conversion was largely completed in time for the beginning of the 2017 football season. NOTE: Roll your mouse over the adjacent thumbnail to see the original (April 2017) version.